London's seasonal fairs, of which Bartholomew Fair was the best known, had, since Medieval times, been a focus for public entertainment, as well as social interaction and commercial transactions. Storytellers and performing bears, jugglers, musicians, and fortune tellers, all vied for the attentions of stall-holders and revelers. 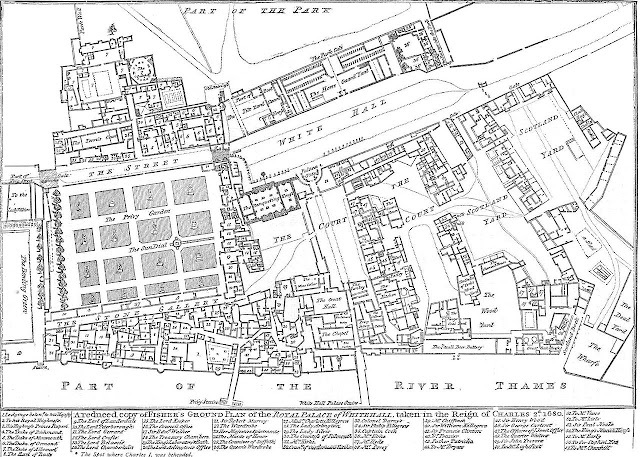 Later, as "London" became more than just "The City," and as burgeoning theatres and shopping arcades attracted increasing numbers of people to "The West End," entrepreneurs from across the British Isles, and from further afield, began to think in terms of "curiosities" that they could "exhibit" for the entertainment of an eager (and sometimes gullible) public. Throughout the Eighteenth and Nineteenth Centuries, there were "sapient pigs," trained to perform calculations, spell out words, and even tell fortunes, by picking up cards with their mouths; "mermaids," created by stitching together the desiccated torsos of monkeys with the tails of fish; and a whole host of bearded ladies, hermaphrodites, and "freaks of nature." 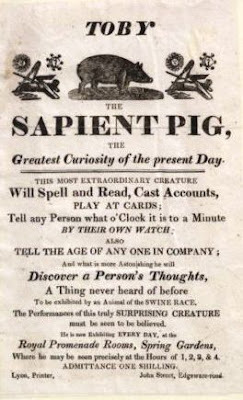 Advertisement for "Toby the Sapient Pig," 1817 (image is in the Public Domain). Often suffering from disabilities or serious illnesses, the living "exhibits" were mercilessly exploited for the profit of others. Some "exhibitions" were overtly racist, as in the case of Sara Baartmans ("the Hottentot Venus"), a woman from southern Africa, who was exhibited in London and Paris between 1810 and 1815. 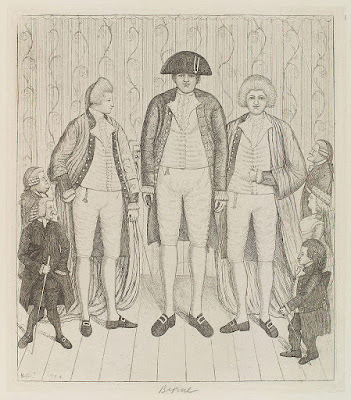 Caricature by William Heath (1810), of Sara Baartman, with the politicians, Richard Sheridan (in green), and Lord Grenville (image is in the Public Domain). Charles Byrne (1761-83), the "Irish Giant," was born in County Tyrone, and arrived in London in 1782. He was 7'7" (2.31 metres) tall, the result (we now know) of the pituitary tumour that would take his life just a year later. 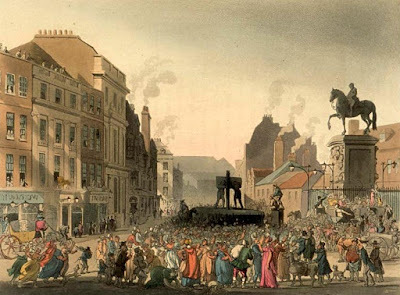 He was exhibited at Spring Garden-gate, Piccadilly, and Charing Cross, and, on his death, his body was acquired, contrary to his own wishes (he had asked to be buried at sea), by the surgeon, John Hunter. 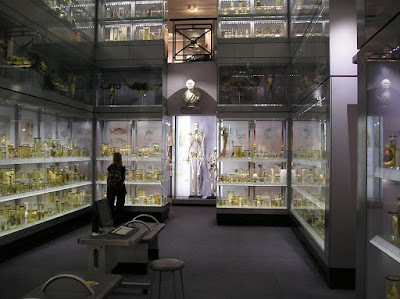 Despite recent attempts to secure a burial for his remains in accordance with his wishes, his skeleton is still on display in the Hunterian Museum in Lincoln's Inn Fields (the remains of Sara Baartman, by contrast, were returned to South Africa for burial). Charles Byrne (centre), flanked by the Knipe brothers (twin giants), by John Kay, National Portrait Gallery D14755 (image is in the Public Domain). The Hunterian Museum, with Charles Byrne's skeleton at the end. Photo: Paul Dean (StoneColdCrazy) - licensed under GNU. 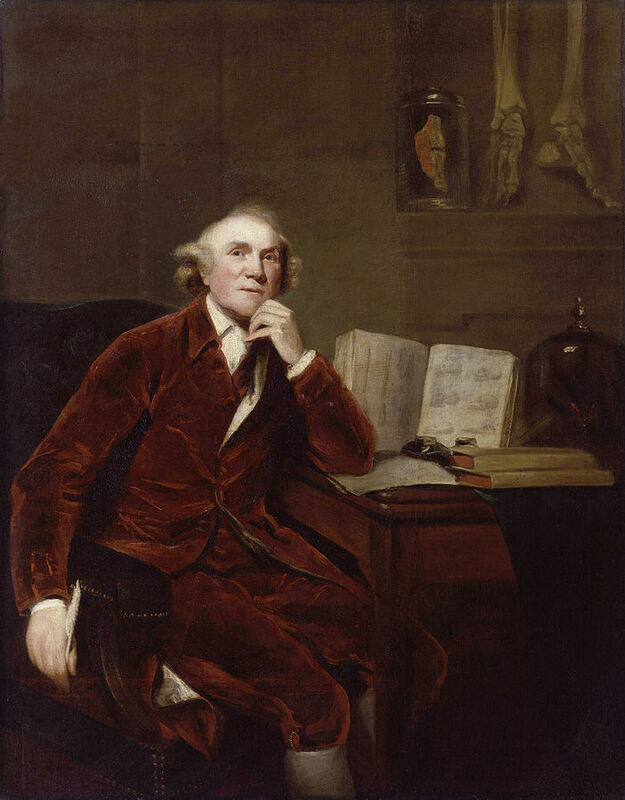 John Hunter, portrait by John Jackson (1815), after a lost original (1786) by Sir Joshua Reynolds: National Portrait Gallery 77 (image is in the Public Domain). 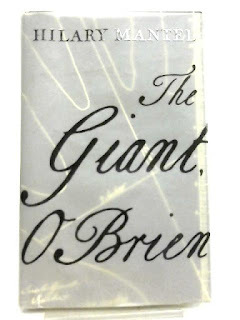 Hilary Mantel's novel, The Giant O'Brien is based on Byrne's life story, but, by changing the name, she gives herself free license to invent the many details that history has not remembered about the real man (we know almost nothing of Byrne's background, character, or life in London beyond his public appearances). In the novel, the life-stories of the giant, Charles O'Brien, and that of the surgeon, John Hunter, are juxtaposed. Both are outsiders in London, but, whilst the dour Scot is a calculating man of science; the Irish giant is a man steeped in traditional story-telling and folklore, a generous and engaging character with an original perspective on London life. Whether this reflects the personality of the real Charles Byrne is open to question (he is unlikely to have had much learning of any kind, and may have suffered from mental impairment as a result of his condition), but what is certain is that London in the Eighteenth and Nineteenth Centuries was a meeting place for people from many different backgrounds, and with sharply contrasting outlooks on the world. "London is like the sea and the gallows. It refuses none. Sometimes on the journey, trapped in the ship's stink and heave, they had talked about the premises they would have at journeys end. They should be commodious, Vance said, and in a fashionable neighbourhood, central and well-lit, on a broad thoroughfare where the carriages of the gentry can turn without difficulty. 'My brother has a lodging in St Clement's Lane,' Claffey said, 'I don't know if it's commodious.' Vance blew out through his lips. 'Nest of beggars,' he said. 'As to your perquisites and embellishments, Charlie, they say a pagoda is the last word in fashion' ... 'Will you have a story?' the Giant soothed them. For the time must be passed, must be passed" ... The Giant did not stop to ask what kind of story they would like, for they were contentious, like fretful children, and were in no position to know what was good for them. 'One day,' he began, the son of the King of Ireland journeyed to the east to find a bride.' 'Where east?' Vance asked, 'East London?' 'Albania,' the Giant said. 'Or far Cathay.'" "Seventeen forty-eight saw John Hunter, a set-jawed red-head astride a sway-backed plodder, heading south towards the stench of tanneries and soap-boilers. He came to London across Finchley Common, with the gibbeted corpses of villains groaning into the wind ... At the top of Highgate Hill he came to the Gatehouse Tavern, and observed London laid out before him. The evening was fine and the air mild." "London is ringed by fire, by ooze. Men with ladders carry pitch-soaked ropes in the street, and branched globes of light sprout fro the houses. Pybus thinks they have come to a country where they do not have a moon, but Vance is sure they will see it presently, and so they do, drowned in a muddy puddle in Chandos Street." 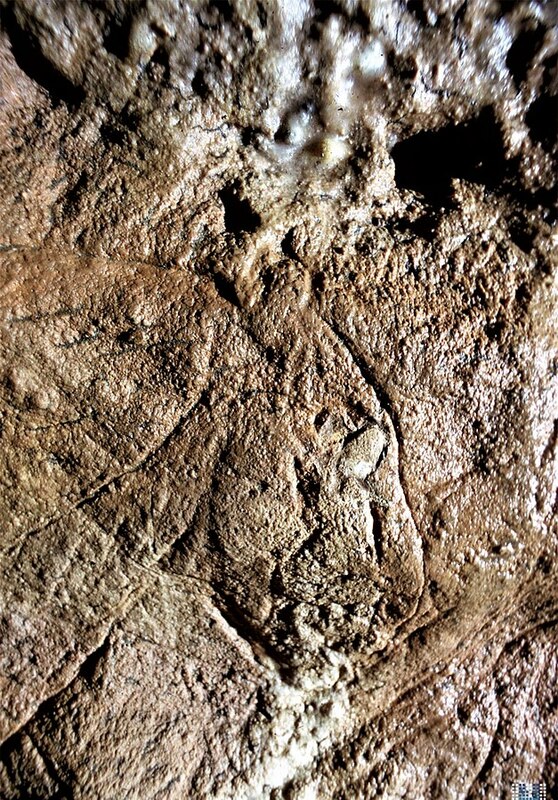 The British sculptor, Antony Gormley, in a recent television programme (available on BBC I-Player until the end of February), explored the question of how art began, among some of the earliest human hunter-gatherer groups during the Pleistocene era (between 2.6 million and 11.7 thousand years ago). Like the exploration of the same topic by the German film-director, Werner Herzog, in his documentary, "The Cave of Forgotten Dreams", his viewpoint is an intensely personal one: that of an artist, confronting the work of his fellow artists (albeit across a chasm spanning tens of millennia); rather than that of an archaeologist or prehistorian, trying to make sense of "Palaeolithic art," alongside other categories of material evidence. Whilst Herzog's exploration was of a specific site (the Chauvet Cave, in the French valley of the Ardeche), Gormley, refreshingly, takes a truly Global perspective, travelling through France and Spain, and on to Australia, by way of Indonesia, taking in, along the way, some of the most important recent discoveries in his field of interest. Antony Gormley and I are separated in age by just fifteen years, and, early in our careers, we both undertook journeys through Europe, alighting (it would seem from the glimpses of his photo album) at many of the same prehistoric sites. His journey took place at the end of his training at the Slade School of Art; whereas my various journeys happened before, during, and after my archaeological studies at Cambridge; so it would be unsurprising if we were seeking answers to different questions (although he had previously followed the same course at Cambridge that I would later follow, and would surely have been taught by some of the same people). Intriguingly for a sculptor, Gormley has almost nothing to say about Palaeolithic sculpture (there is plenty of it, in ivory, bone, and stone, and some of the finest pieces featured in the British Museum's recent "Ice Age Art" exhibition), focusing instead on the paintings and engravings found on the walls of caves, and on outcrops of rock. His journey begins, unsurprisingly, in the French valley of the Dordogne, at the site of Les Combarelles, which featured in my youthful "Grand Tour," as it did in his. 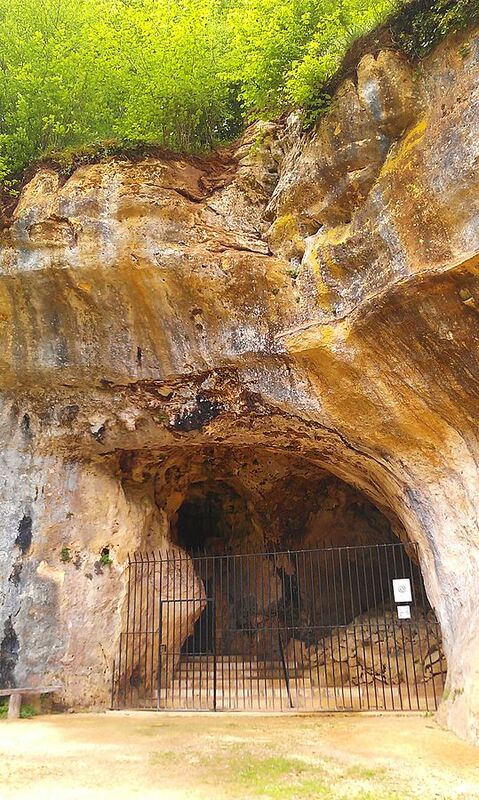 The cave of Les Combarelles. Photo: Ethan Doyle White (licensed under CCA). Engraving of a lion, Les Combarelles. Photo: Heinrich Wendel (licensed under CCA). 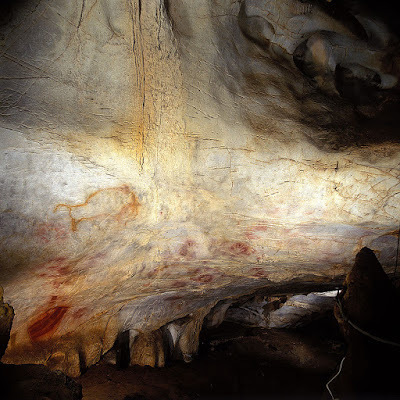 The cave contains more than six hundred paintings and engravings, made by hunter-gatherers between thirteen and eleven thousand years ago. For Gormley, it is "a cathedral of memory, but also of joy in living things," and reflects the timeless concern of the artist with the question: "what does it feel like to be alive now." He continues to the nearby cave of Font-de-Gaume, where the art is seventeen thousand year old. "It's the act of drawing that's the thing," he concludes, "and maybe it came, and maybe it didn't." We must, he insists, "give up on the idea of the hairy caveman being a brute," but I imagine that he must have given up on such ideas, as I had, before beginning his studies, or we would neither of us have made the early-career "pilgrimages" that we did. Reindeer depicted on the wall of Fond-de-Gaume. Image: H. Breuil, 1912 (image is in the Public Domain). 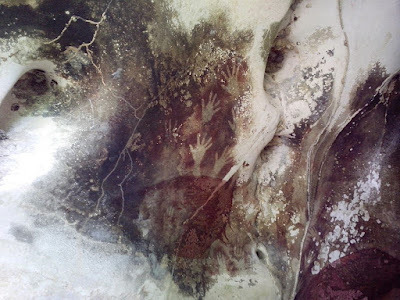 At Pech-Merle, he meets the French prehistorian, Michel Lorblanchet, who has undertaken an experimental reconstruction of some of the painted works. Hand-stencil from Pech-Merle. Photo: French Ministry of Culture, PA00094994 (image is in the Public Domain). 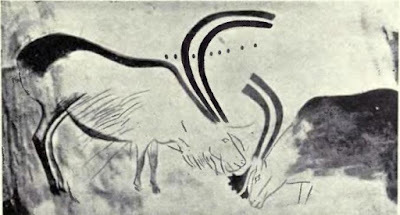 Horses depicted at Pech-Merle. Photo: Kersti Nebelsiek (image is in the Public Domain). "No cities were yet ringed round with deep, precipitous earthworks; long straight trumpets and curved bronze horns never summoned to battle ... but nations were free to practice the gentle arts of peace. The Earth was equally free and at rest, untouched by the hoe, unscathed by the plough-share, supplying all needs from its natural resources. Content to enjoy the food that required no painful producing, men simply gathered arbutus fruit and mountain strawberries ..." (Ovid's Metamorphoses, translated by David Raeburn, Penguin Classics). This is unlikely to have been the view of an Ice Age forager-artist, standing with her daughters looking down on the valley of the Lot, or the Dordogne. At Niaux, in the French Pyrenees, Gormley encounters "a very different kind of imagery." It reminds him of the work of Picasso, and, as he explains, he does not care for Picasso "because he was a predator." For him, this art is full of egotism, and obsessed with death, infused with "our species sense of superiority, and the right to end the lives of other creatures." He sees in it "the beginning of the end" of a world view based on a appreciation of the human role within nature, yet its artists lived between twelve and fourteen thousand years ago, and may well have been the contemporaries of those at Les Combarelles. Perhaps, in his own terms, Gormley has simply encountered an individual artist for whom he does not care? Bison depicted at Niaux. Photo: HTO (image is in the Public Domain). The journey continues into Spain, where Gormley visits the site of La Cueva del Castillo. The art here is, at least superficially, similar to some of that at Pech-Merle, but the surprise comes with the dating: the hand-stencils here go back some forty thousand, eight hundred years, meaning that a wider chasm separates its artists from those of Niaux or Les Combarelles than separates them from contemporary artists such as Damien Hirst, Tracey Emin, or Antony Gormley himself. Paintings in the Cueva del Castillo. Photo: Government of Cantabria (licensed under CCA). 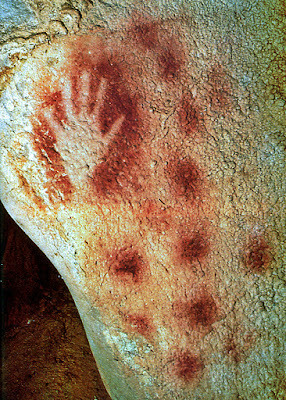 Hand-stencils in the Cueva del Castillo. Photo: Miguel Anguel de Arribas (licensed under CCA). This poses further questions. Gormley was presumably taught at Cambridge, as I was, that the practice of art was unique to fully modern humans, our own species, Homo sapiens sapiens. 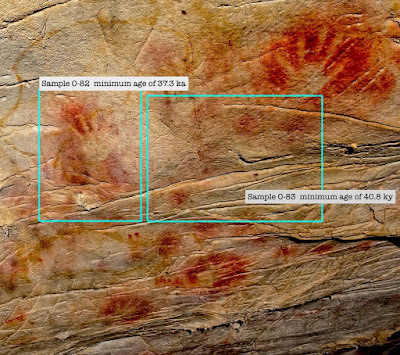 Yet the dates from El Castillo, and other sites in Spain (some going back more than sixty thousand years) raise the likelihood that art was being produced by some of the other human species (including Neanderthals) with whom our ancestors shared the Earth over a period of millennia (most modern Europeans, in any case, share a proportion of Neanderthal DNA, showing that the two species not only interbred, but that the offspring were fertile, and some of them were, themselves, our ancestors). Further surprises (at least for those who have not been following the most recent discoveries at conferences, or via social media) come from further afield. At Petta Kare, on the Indonesian island of Sulawesi, hand stencils remarkably like those from El Castillo and Pech-Merle have been found to date back forty thousand years; and the site itself seems to have continued in use for more than a millennium, with later artists, around thirty thousand years ago, adding representations of the babirusa, a native wild pig (images not publicly available, although they are shown in Gormley's film). Hand-stencils from Petta Kare. Photo: Cahyo Ramadhani (licensed under CCA). 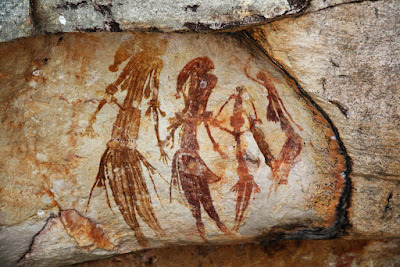 In Australia, the dating evidence is, for the moment, more ambiguous, but the earliest art may date back as far as sixty thousand years. Here again, however, we encounter the restless ghosts of Jean-Jacques Rousseau, Ovid, and Hesiod; which haunt not the sacred places of the Aboriginal Australians, but rather the deepest recesses of our own European imaginations. Modern Aboriginals, some of them artists themselves, are presented as the direct inheritors of this ancient tradition, but can this be any more true than to see Antony Gormley as standing in a direct line of succession from the unnamed masters (or, indeed, mistresses) of Pech-Merle? Human figures from Kimberley, Western Australia. Photo: Tim JN1 (licensed under CCA). Aboriginals are not "survivors" from the Palaeolithic (except in the sense that we all are), clinging to a tradition that the rest of us abandoned more than ten centuries ago, but, like us, inventors and innovators of their own dynamic culture. 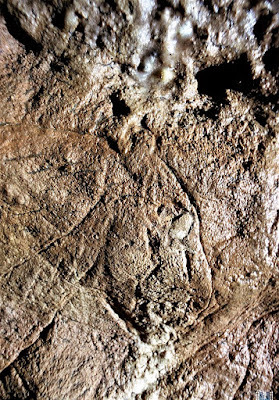 Antony Gormley is, I suspect, very likely to be proven right in his belief that we would find early prehistoric art in other regions of the world (in Africa and India, for example), "if only we looked hard enough." In the course of this looking, we might well discover that the human concern with "leaving a trace," which we see alike in the surviving works of the World's earliest artists, and in those of contemporary artists around the World, is written into the DNA, not only of our species (Homo sapiens sapiens), but of an entire genus (Homo), of which we happen to be the only surviving representatives. A visitor to London, exploring the City of Westminster, and having explored Parliament Square, can walk northwards, along Whitehall, to Trafalgar Square. 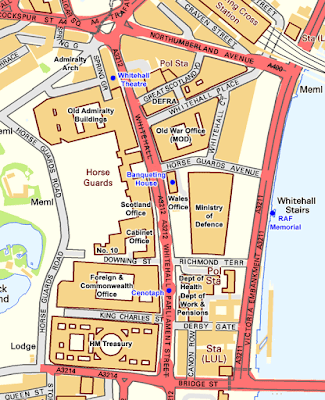 Whitehall today is lined, as it has been since the Seventeenth Century, by government buildings (HM Treasury, The Ministry of Defence, The Scottish and Welsh Offices), and by statues of some of the leading figures in British military history. Downing Street, where the Prime Minister of the day resides, leads off from it, as does Scotland Yard, formerly the headquarters of the Metropolitan Police from 1829. Whitehall also forms part of one of the most important ceremonial routes in the life of the nation: Royal coronation, wedding, and funeral processions pass this way (replacing the Medieval and Early Modern processional route from the Tower of London through the City); and it is at the heart of the annual commemoration of British and Commonwealth War dead. 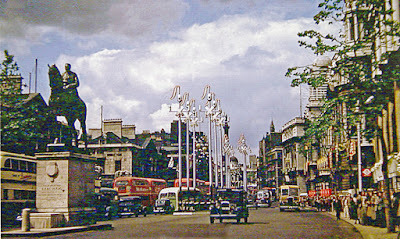 Whitehall in 1953, decorated for the coronation of Queen Elizabeth II. Photo: Ben Brooksbank (licensed under CCA). 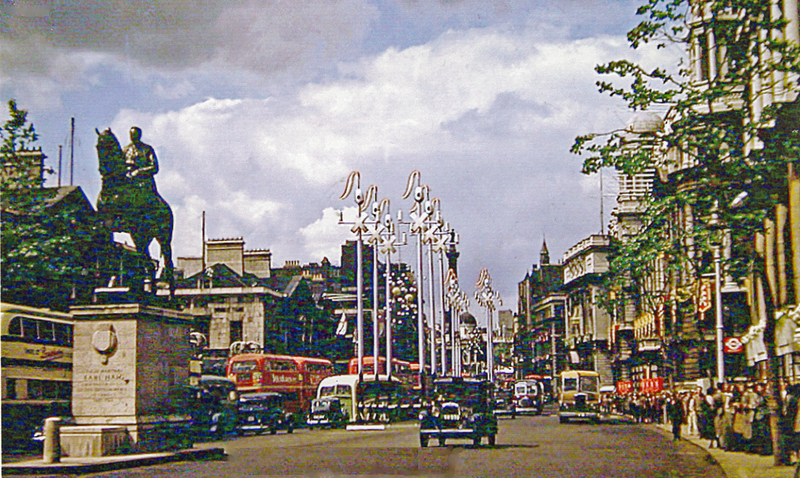 Whitehall today, looking south, with the Monument to the Women of World War II; and the Cenotaph in the background. Photo: Tbmurray (licensed under CCA). In the Thirteenth Century, the area lay outside the precincts of the Palace of Westminster. Most of the English bishops and archbishops kept palaces in London, allowing them to participate in the life of the Court, including the House of Lords. 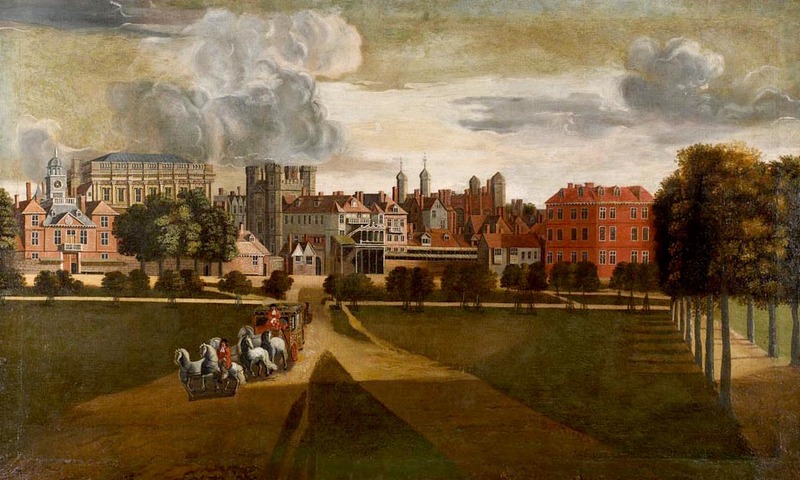 This was York Place, the London palace of the Archbishops of York. As such, it was occupied by Cardinal Wolsey, but was later seized from him by Henry VIII. 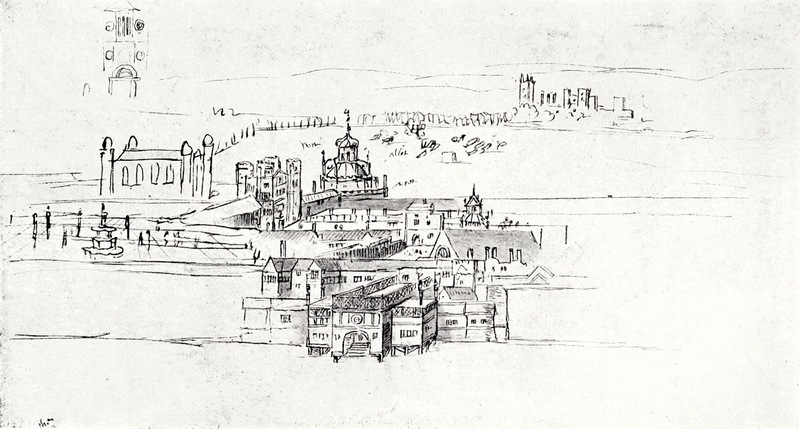 Sketch of the Palace of Whitehall, c 1544, including a water-gate (image is in the Public Domain). During the reigns of Edward VI, Mary I, and James I, the two palaces (Westminster and Whitehall) functioned, in effect, as a single complex. Henry VIII added a bowling green and tennis court, and James I commissioned Inigo Jones to design what is now "The Banqueting House." 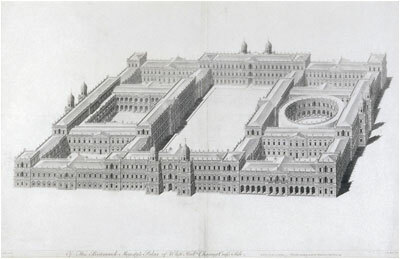 Inigo Jones's plan for a new Palace of Whitehall, c 1638 (image is in the Public Domain). 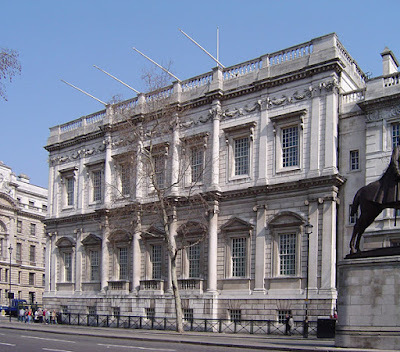 The "Banqueting House." Photo: ChrisO (licensed under GNU). 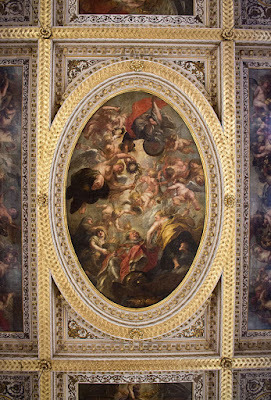 The ceiling of the "Banqueting House," painted by Peter Paul Rubens, and commissioned by Charles I as a memorial to his father, James I. Photo: The Wub (licensed under CCA). In 1606, Shakespeare's Macbeth, with its dark themes of regicide and ensuing chaos, received its first performance in this building, in front of James I and his Queen, Anne of Denmark; yet just forty-three years later, the same building witnessed a true regicide, as their son, Charles I, stepped out from one of its windows onto the scaffold, witnessed by a young Samuel Pepys, who recalled a single Biblical verse: "The memory of the wicked shall rot." The execution of Charles I, c 1649 (image is in the Public Domain). 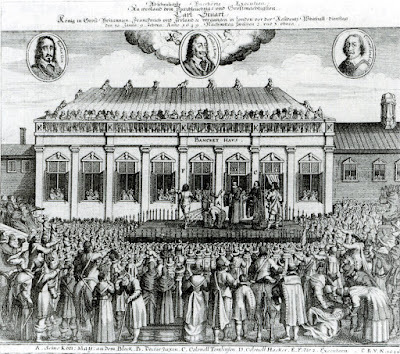 Pepys had been taken to witness the execution by his father's cousin, the Republican, Sir Edward Montagu, and, during the Commonwealth era, the Palace of Whitehall was occupied by Montagu's patron, Lord Protector Oliver Cromwell. A few decades on, both Montagu and Pepys were Royal servants, playing key roles in the Navy of Charles II. Pepys began his career as a Naval administrator living, effectively, as Montagu's servant, in his grace and favour apartment in Axe Yard; and later had his own home and offices nearby. There were bars and restaurants in New Palace Yard, where Pepys wined and dined his business contacts and his mistresses; and a theatre, where he enjoyed plays. 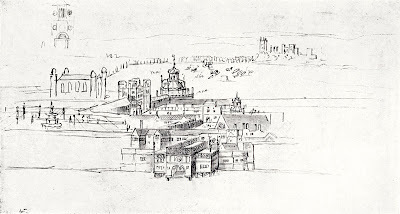 The Palace of Whitehall in 1680 (image is in the Public Domain. 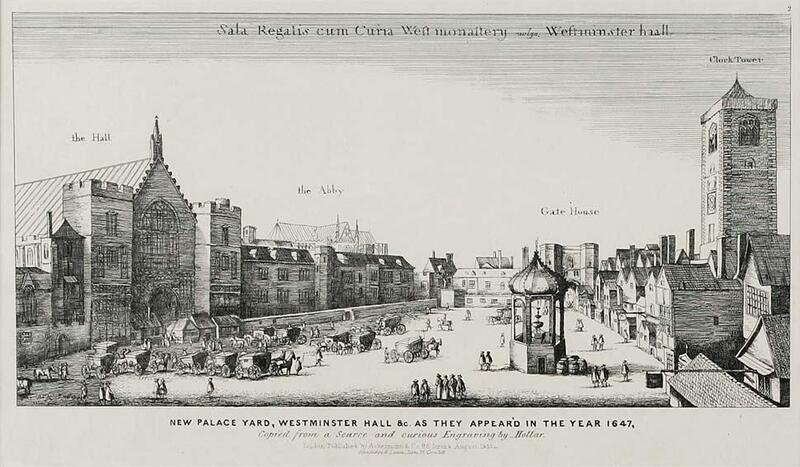 New Palace Yard in 1647, by Wenceslas Hollar (image is in the Public Domain). 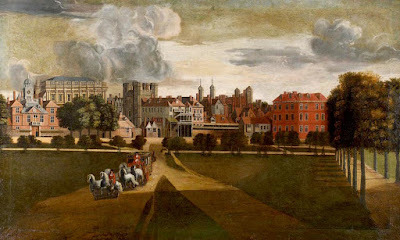 The old Palace of Whitehall, by Hendrick Danckaerts, c 1675, with the "Banqueting House" on the left (image is in the Public Domain). Whitehall was re-modeled as a public street in the Eighteenth Century, and the elements of the former palace were gradually dismantled, leaving only the "Banqueting House" as a reminder of its former glories. 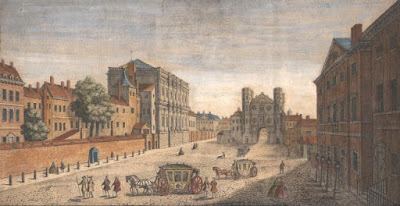 Whitehall in 1740, looking south, by John Maurer: the "Banqueting House" is on the left (image is in the Public Domain). The "Holbein Gate" at the centre was builtin 1532, and demolished in 1759. 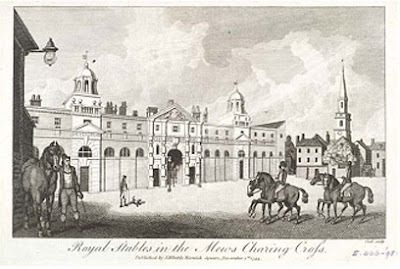 The Horse Guards Building was designed by William Kent (better known for the interiors and gardens of stately homes), and built, after his death, between 1750 and 1759. Photo: Alistair Welkin (licensed under CCA). 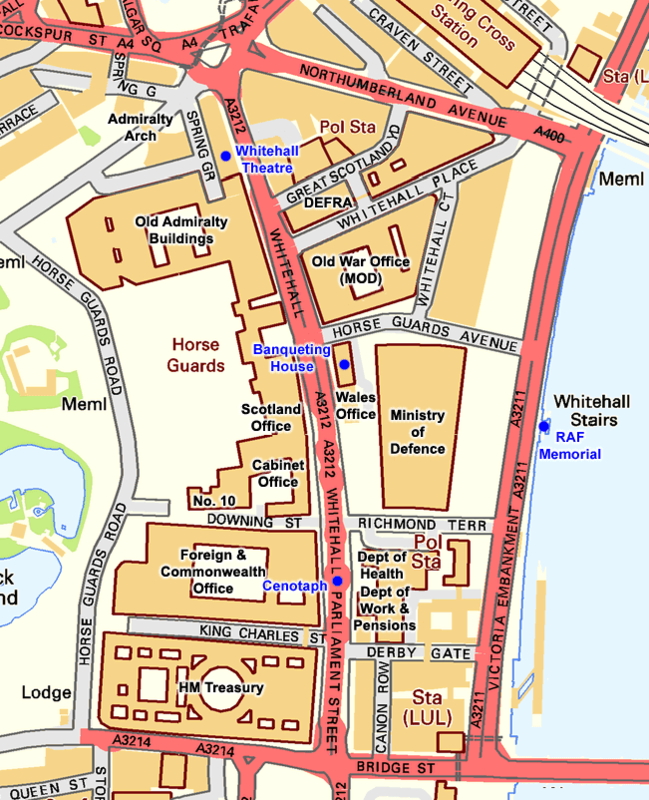 The modern layout of Whitehall (Ordnance Survey, image is in the Public Domain). 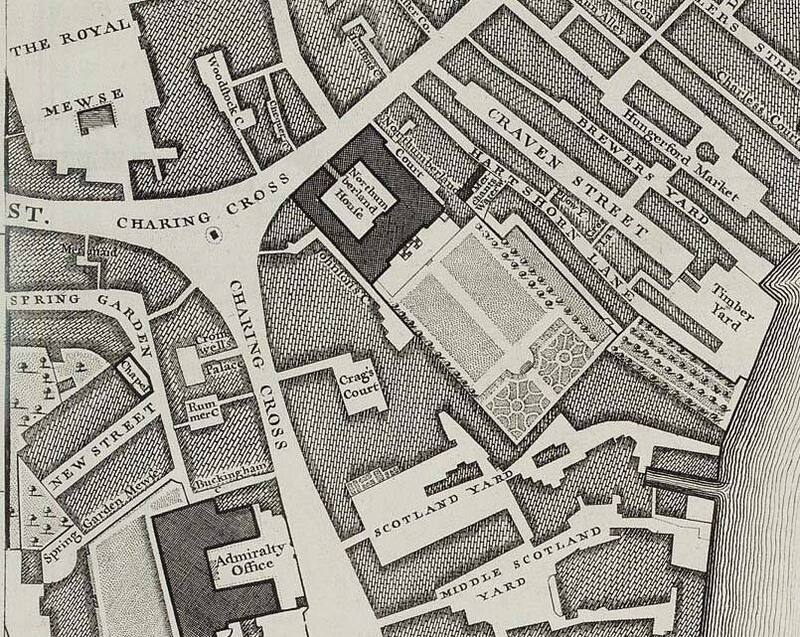 At the Northern end of Whitehall stood Charing Cross, built between 1291 and 1294 to commemorate the funeral procession of Eleanor of Castille, Edward I's Queen. 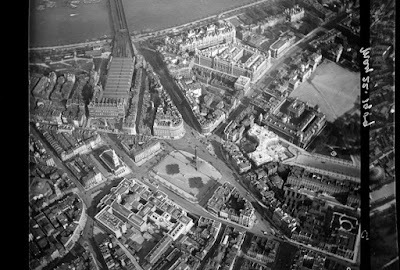 This was destroyed as an "idolatrous" symbol during the era of Cromwell's Commonwealth (the copy that now stands outside Charing Cross Station in The Strand was built during the Nineteenth Century. An equestrian statue of Charles I was erected, in its place, in 1675, and has stood there ever since. 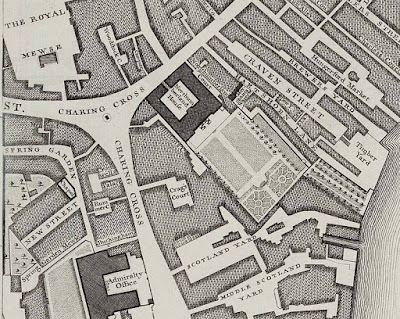 Charing Cross, from John Rocque's map of 1746 (image is in the Public Domain). Northumberland House was the London residence of the Percy family, Dukes of Northumberland. Charing Cross and Northumberland House, by Canaletto, 1752 (image is in the Public Domain). 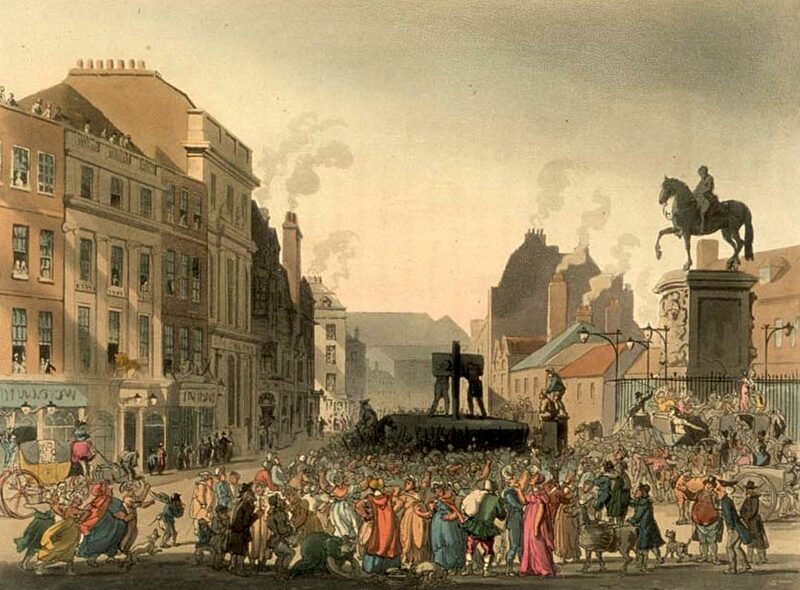 The pillory at Charing Cross, by Thomas Rowlandson & Augustus Charles Pugin, 1809 (image is in the Public Domain). Trafalgar Square as we know it today was laid out between 1842 and 1843, the present National Gallery standing on the site of a succession of royal stables, the earliest of which seems to have been built in the Thirteenth Century, to house the King's falcons, as well as his horses. Trafalgar Square is, in a very real sense, the symbolic heart of London, a venue for both public celebrations and political protests. The Royal Stables at Charing Cross, designed by William Kent, and completed in 1793 (image is in the Public Domain). 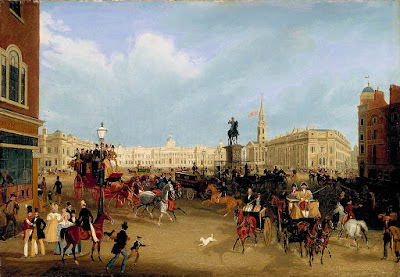 Trafalgar Square before the building of Nelson's Column, by James Pollard, c 1839. Berger Collection, Denver, Colorado (image is in the Public Domain). Trafalgar Square taken by Sir Norman Lockyer from a helium balloon, 1909 (image is in the Public Domain).